Shop eCampus, online at eCampus.com, for the best discounts on textbooks and college clothing. At eCampus you can sell, rent, or buy textbooks, so there’s no need to go broke while you study. eCampus has thousands of new and used textbooks, and even eTextbooks, which are cheaper and environmentally friendly. 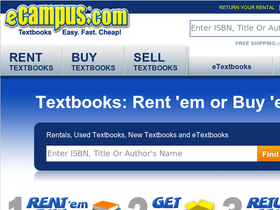 Use the eCampus rent and return system for a semester, or make some cash using the textbook buyback system. Just be sure to visit RetailSteal.com first for eCampus promo codes, eCampus discounts, and eCampus coupons. eCampus offers free shipping on orders of $59 or more. Shipping starts as low as $2.98 + $0.99 per item. If you would like to make a return, be sure to do so within 30 days of shipment. Check site for full details, exclusions may apply. Spend $150 or more at ecampus and use this coupon code to enjoy a $10 discount. Click to save. Use this coupon code at eCampus to save 5% on your purchase. Click link to shop. Get free shipping and $10 off any order of $150 or more when shopping online at eCampus.com. Click to save. At eCampus, get 2% off your order using the coupon code. Click link for savings. Shop at eCampus and enjoy 5% savings on your order. Click here for code. Use this coupon code on eCampus.com to save $5 on your order of $50 or more. Click link to save $3 off your order of $50 or more with this exclusive Retail Steal coupon code for eCampus.com. Shop at eCampus and enjoy $5 savings on orders $100+. Click here for code. Use the coupon code at eCampus and save $3 on your order of $60 or more. Click link to shop online. Shop at eCampus and enjoy a free gift. Click here for code. Save $6 on purchases of $99 or more at eCampus today when you enter our coupon code at checkout online.